Konstantin Süvalo searched for his style for quite a long time and it did not develop until the 1920’s. He began his studies in art in Riga relatively late in life at the age of 25, and he did not succeed in enrolling in the Academy of Art in St. Petersburg because of the First World War. Instead, he began his lengthy career as a schoolteacher in Pärnu in 1914. Little is known of Süvalo’s early work yet the years 1915-1929 are considered the period when he searched for his style: cubist and neo-impressionist works of his are known, his colouring changes almost from painting to painting, his moods are somewhere between lyrical, expressive and anxious. His main genre had nevertheless evolved quickly and it was landscapes, even though alongside landscapes he also painted flower pieces, figurative paintings, portraits, and other genres. Süvalo went to Paris in 1929. He arrived in the city in February or March and expressed his elation in his first letters (among other things, he recommended considering whether two art schools were really necessary in Estonia since either way, studying in Paris is still the best option). Süvalo also visited the Louvre and was enraptured by Leonardo da Vinci’s "Mona Lisa". He also admired Paris’s integral general architectural appearance. He worked at L’Academie de la Grande Chaumiere when he was in Paris, participating in an exhibition there with three of his works. A certain calming in Süvalo is usually associated with his works completed in Paris, and his style is seen as becoming more confident and stable. At the same time, however, his colouring also became considerably darker than it had been before. He did not stay long in Paris, only until 1930. Süvalo was relatively productive in Paris and he completed many works. 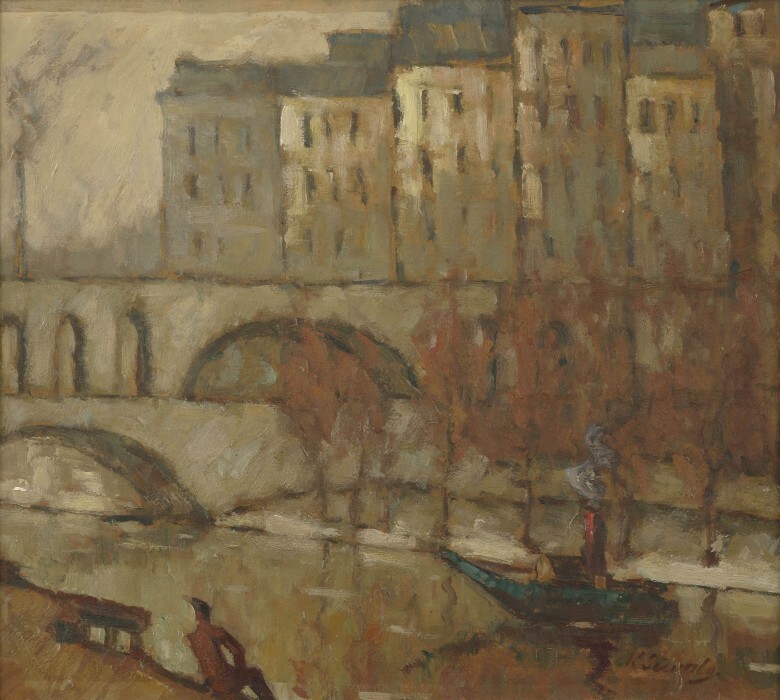 This work is a slightly smaller version of his work "The Bank of the Seine" (1930), differing from it only in small details. Versions that repeat down to the smallest details are known in the case of several of Süvalo’s other works as well. 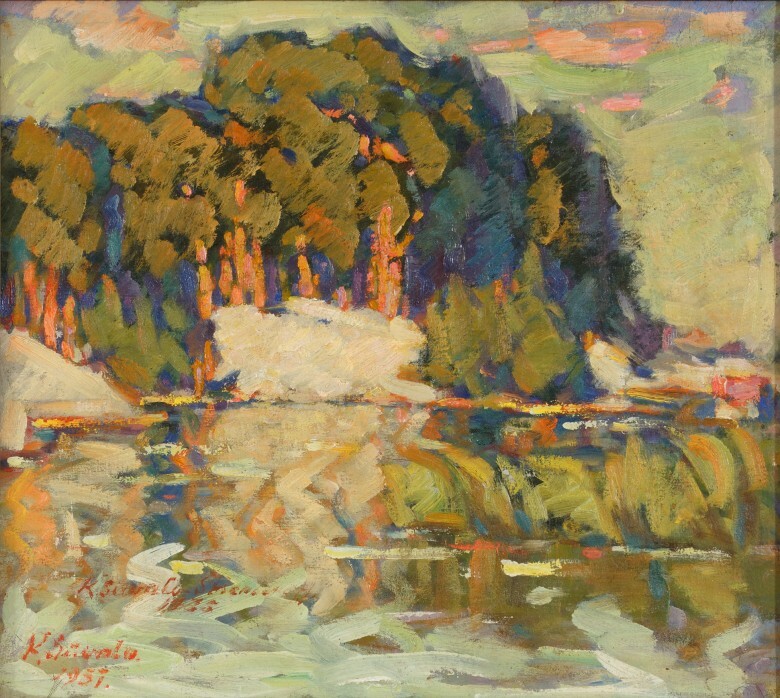 "The Bank of the Seine" is one of the best-known works in Süvalo’s body of creative work and has also been displayed repeatedly. Konstantin Süvalo worked daily as a schoolteacher in Pärnu at the time when he completed "Tammiste". He often undertook painting excursions to different places in Estonia (also including Southern Estonia), probably combining them with his passionate interest in fishing. Tammiste is a village in Pärnu County in Sauga Rural Municipality, located on the banks of the Pärnu River.